February 20, 2019 6 – 7:30 p.m. 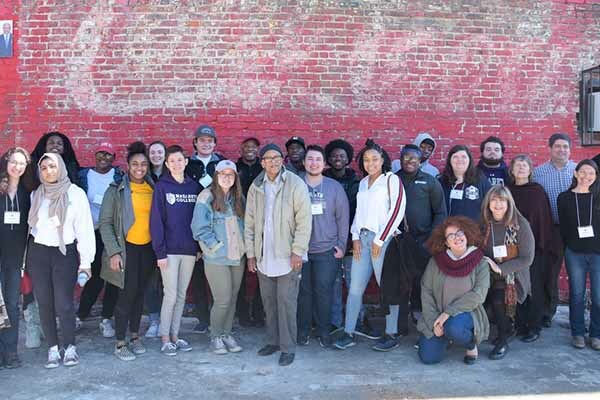 The 2019 Civil Rights Journey team invites you to learn about the experiences of their recent Solidarity and Social Justice Retreat. The nine-day journey through Alabama, Mississippi and Tennessee provided a first-hand account of the remnants of slavery, Jim Crow and the Civil Rights Movement. The group traveled to Birmingham, Selma, and Montgomery, Alabama; Marion and Jackson Mississippi; and Memphis, Tennessee. They visited historical sites, meet with activists, historians and scholars. While in Selma, they worked with the Sisters of St. Joseph and learned about Nazareth's connection to the region. We hope you will join us in exploring ways to foster tolerance in the face of prejudice and discrimination, to nurture peace when confronted by violence and injustice, and to cultivate compassion when besieged by bigotry and hatred. The Civil Rights Journey, Solidarity and Social Justice Retreat is sponsored by the Division of the Vice President for Diversity and Inclusion and the Nazareth Undergraduate Association.